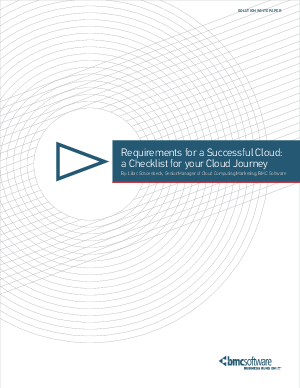 For many organizations, moving to the cloud to meet the needs for business services represents a tremendous investment of both time and financial resources, without clear instructions for reaching their goals. This road map takes into consideration the ultimate needs of the business, the efficiency and effectiveness of IT, best practices, and future needs. Make sure your cloud meets the needs of the business — both today and tomorrow. Get BMC’s checklist to clear your path to success.